A team consisting of 8 people (three employees for the workshop, three technicians, an assistant and a person in charge of the Test Center) offer their experience in technical support, trials and training every day. A calendar of the training sessions organized in the Test Center is published annually. 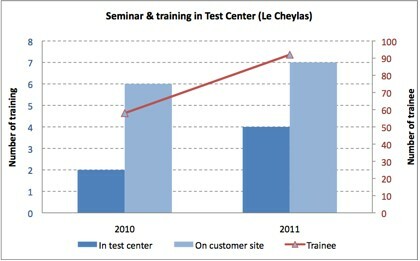 In 2011, 4 seminars were organized within the Test Center and 7 directly on customers' sites, representing training for a total of 92 W Abrasives customers. Growth in the number of seminars, training sessions and trained customers. Le Cheylas site offers customers a total of 5 wheel machines and 1 blasting room. 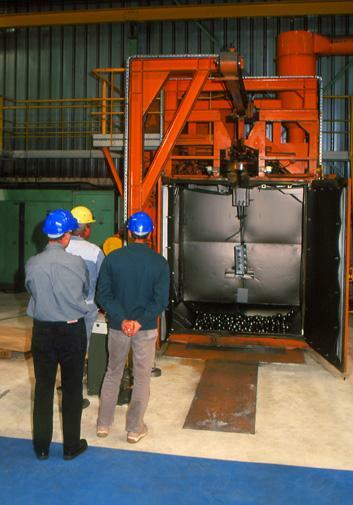 Customers can simulate all blasting processes using an extremely wide range of settings. W Abrasives Test Centers are genuine industrial workshops where all types of blasting machine are represented in order to simulate all blasting processes using an extremely wide range of settings.